Not to be confused with Fake Prophet. "Beware of false prophets, who come to you in sheep’s clothing but inwardly are ravenous wolves. You will know them by their fruits. Are grapes gathered from thorns, or figs from thistles? So, every sound tree bears good fruit, but the bad tree bears evil fruit. A sound tree cannot bear evil fruit, nor can a bad tree bear good fruit. Every tree that does not bear good fruit is cut down and thrown into the fire. Thus you will know them by their fruits." One well-known New Testament false prophet is the false prophet mentioned in the Book of Revelation. The Apocalypse's false prophet is the agent of the Beast, the Antichrist, and he is ultimately cast with the Beast into the lake of "fire and brimstone" (Revelation 19:20, 20:10). Another mention of a false prophet in the New Testament is an antichrist spirit which denies the Son. The Quran portrays Muhammad as the Seal of the Prophets, which is understood by mainstream Sunni and Shia Muslims to mean that anyone who claims to be a new prophet after him is a false prophet. All mainstream Muslim scholars' perspectives from both Sunni and Shia denominations do not see the second coming of the Messiah as the coming of a new prophet, as the Islamic Messiah Jesus had already been an existing prophet, and will rule by the Qur'an and Sunnah of Muhammad, bringing no new revelation or prophecy. "There will be 30 dajjals among my Ummah. Each one will claim that he is a prophet; but I am the last of the Prophets (Seal of the Prophets), and there will be no Prophet after me." —  Related by Ahmad ibn Hanbal as a sound hâdith. "The Hour will not be established until two big groups fight each other whereupon there will be a great number of casualties on both sides and they will be following one and the same religious doctrine, until about 30 dajjals appear, and each of them will claim that he is Allah's Apostle..."
—  Sahih al-Bukhari, Volume 9, Book 88: Afflictions and the End of the World, Hâdith Number 237. "Verily by Allah, the Last Hour will not come until 30 dajjals will appear and the final one will be the One-eyed False Messiah." —  Related by Imam Ahmed and Imam Tabarani as a sound hâdith. "There is never a prophet who has not warned the Ummah of that one-eyed liar; behold he is one-eyed and your Lord is not one-eyed. Dajjal is blind of one eye On his forehead are the letters k. f. r. (Kafir) between the eyes of the Dajjal which every Muslim would be able to read." —  Sahih Muslim, Book 41: The Book Pertaining to the Turmoil and Portents of the Last Hour, Chapter 7: The Turmoil Would Go Like The Mounting Waves of the Ocean, Ahâdith 7007-7009. Imam Mahdi, the redeemer according to Islam, will appear on Earth before the Day of Judgment. At the time of the Second Coming of Christ, the Prophet 'Isa (Jesus Christ son of Mary) will kill al-Masih ad-Dajjal (The Antichrist). Muslims believe that both Jesus and Mahdi will rid the world of wrongdoing, injustice and tyranny, ensuring peace and tranquility. Jesus is rejected in Judaism as a failed Jewish Messiah claimant and a false prophet. "If a prophet, or one who foretells by dreams, appears among you and announces to you a miraculous sign or wonder, and if the sign or wonder of which he has spoken takes place, and he says, 'Let us follow other gods' (gods you have not known) 'and let us worship them,' you must not listen to the words of that prophet or dreamer. The Lord your God is testing you to find out whether you love him with all your heart and with all your soul. It is the Lord your God you must follow, and him you must revere. Keep his commands and obey him; serve him and hold fast to him. That prophet or dreamer must be put to death, because he preached rebellion against the Lord your God, who brought you out of Egypt and redeemed you from the land of slavery; he has tried to turn you from the way the Lord your God commanded you to follow. You must purge the evil from among you" (Deuteronomy 13:1–5 NIV). "Micaiah continued, 'Therefore hear the word of the Lord: I saw the Lord sitting on his throne with all the host of heaven standing around him on his right and on his left.' And the Lord said, 'Who will entice Ahab into attacking Ramoth Gilead and going to his death there?'" "One suggested this, and another that. Finally, a spirit came forward, stood before the Lord and said, 'I will entice him.'" "'By what means?' the Lord asked." "'I will go out and be a lying spirit in the mouths of all his prophets,' he said." "'You will succeed in enticing him,' said the Lord. 'Go and do it.'" "So now the Lord has put a lying spirit in the mouths of all these prophets of yours. The Lord has decreed disaster for you" (1 Kings 22:19–23 NIV). 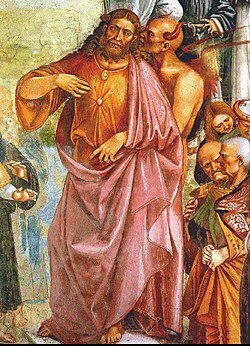 It is possible that Micaiah meant to depict the false prophets as a test from YHWH. It is also possible that it was meant as a slur on Ahab's prophets, such as Zedekiah, the son of Chenaanah. The penalty for false prophecy, including speaking in the name of a god other than YHWH or speaking presumptuously in YHWH's name, is capital punishment. 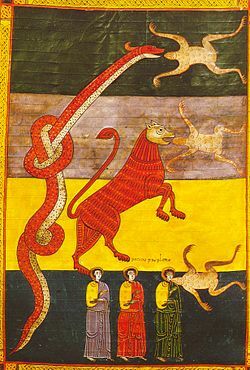 Likewise, if a prophet makes a prophecy in the name of YHWH that does not come to pass, that is another sign that he is not commissioned of YHWH and that the people need not fear the false prophet. The Jewish Koine Greek term pseuoprophetes occurs in the Septuagint Jeremiah 6:13, 33:8,11 34:7, 36:1,8, Zechariah 13:2, Josephus' Antiquities 8-13-1,10-7-3, War of the Jews 6-5-2, and Philo Specific Laws 3:8. Classical pagan writers use the term pseudomantis. The term false prophet is sometimes applied outside religion, to describe promoters of scientific, medical, or political theories which the author of the phrase thinks are false. Paul Offit's 2008 book Autism's False Prophets applied the phrase to promoters of unproven theories and therapies such as the thiomersal controversy and chelation therapy. Ronald Bailey's 1993 book Ecoscam: The False Prophets of Ecological Apocalypse applied the phrase to promoters of the global warming hypothesis; however, by 2005 Bailey had changed his mind, writing "Anyone still holding onto the idea that there is no global warming ought to hang it up." ^ Gunny, Ahmad (19 Apr 2011). Prophet Muhammad in French and English Literature: 1650 to the Present. The Islamic Foundation. p. 94. ISBN 0860374785. ^ Tolan, John Victor, ed. (15 September 2000). Medieval Christian Perceptions of Islam: A Book of Essays. Routledge. p. 99. ISBN 0415928923. ^ "The Signs Before the Day of Judgment by Ibn Kathîr". Qa.sunnipath.com. 2005-07-03. Archived from the original on 2012-03-15. Retrieved 2012-05-24. ^ Offit, Paul A. (2008). Autism's False Prophets: Bad Science, Risky Medicine, and the Search for a Cure. Columbia University Press. ISBN 978-0-231-14636-4. ^ Bailey R (2005-08-11). "We're all global warmers now". Reason.